Intrigued by the underwater world, but don’t want to go through the hassle of getting your scuba diving certification? Don’t worry, there’s a personal submarine with your name on it! Stuart’s Cove in the Bahamas offers a variety of unique experiences at sea, and their SUB adventures are perfect for those looking for a different type of underwater fun. You can be one with the fishies as you pilot your own scooter around the aquatic world of Nassau, cruising past spectacular marine life and beautiful coral reefs. You can even have the chance to visit a portion of the movie set from Jaws 4: The Revenge! You’re basically a living breathing Jaws character. The key word there is breathing, as your head will stay completely dry as you breathe normally in an air bubble. 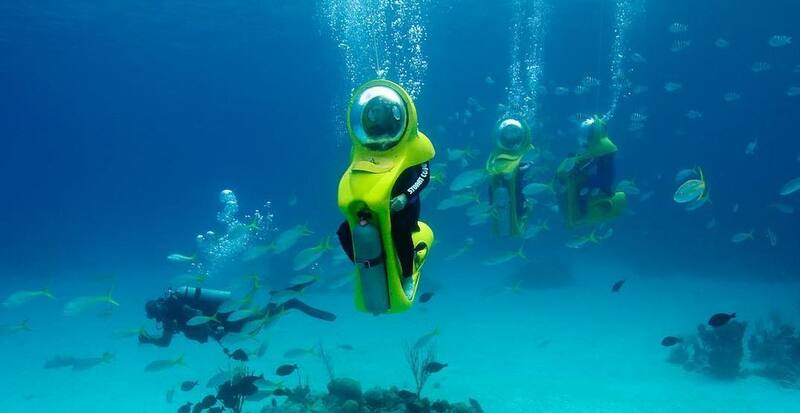 This means that you don’t need to go through the extensive course required for scuba diving, but just complete an orientation and the ocean is yours – well, it’s yours up to 15 feet deep, which is the maximum depth these scooters can go underwater. Standard prices start at $138 USD per person, and you have to be 12 years or older and in good physical health to be eligible as an undersea pilot (that’s right, undersea pilot… the title we never knew we needed until now). Share all your adventures with us, underwater or over, using #dailyhivemapped!